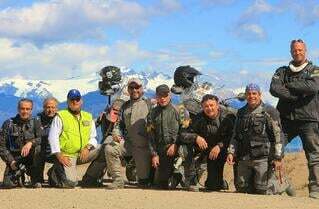 Truck Supported Motorcycle Tour Package, "Full Patagonia Adventure"
The Self-Guided, Truck Supported, "Full Patagonia Adventure" Package! 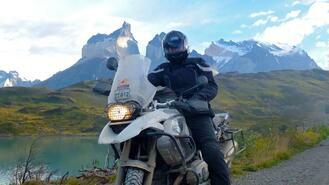 Contact Eric About the Self-Guided, Truck Supported Full Patagonia Adventure! Pucón, the "Adventure Capital of Chile," also listed amongst the "20 Towns in the World That Look Like Fairy Tales"
The Carretera Austral, the stunning "Highway to the South!" Parque Nacional Los Alerces, home of the tallest trees in South America called "Fitzroyas"
Optional Rest Day ride into the famous "Patagonia Park"
Terrain: In terms of distance, approximately 30% dirt/gravel and 70% pavement. In terms of "time spent riding," this is approximately 40/60% as we ride slower when off-pavement. 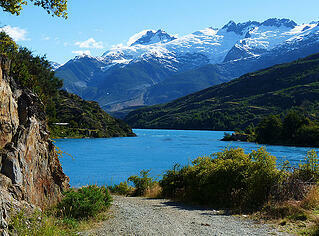 This changes each season though, as more and more pavement is being installed throughout Patagonia & Tierra del Fuego. Riding Skill Required: Ability to deal with changing surfaces including pavement, dirt, sand, gravel, mud, and extreme winds. None of the route will be single-track type trails. Rest Day Options: Whitewater River Rafting, Fly-Fishing, Kayaking, Boat Tours, Canopy Tours, Horseback Riding, Hiking, or just relaxing! Weather Statistics: Click here for statistics Temuco, Chile and here for Ushuaia, Argentina for examples. 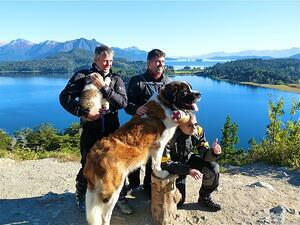 Meet Your Truck Guides: Click here to meet Ulli, Andres, and Eric as they will be showing you the way in Patagonia! 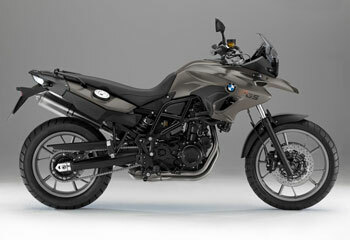 Basic motorcycle crash protection bars, etc. Any non-mentioned meal, item, or service as "included"
*Base Pricing based on 6-rider minimum per group. Trip may continue with fewer than 6 riders, but price adjustment may be necessary. This "Self-Guided & Truck Supported" trip format is one of our most popular options for adventure riders, and for good reason! Shown here as the "Full Patagonia Adventure" package, we've combined the pure, raw, Self-Guided feeling of 'riding solo' through Patagonia with the comfort, safety, and convenience of having a Support Truck & Guide there to follow you each day. 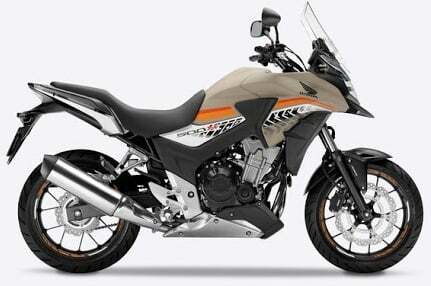 With this package, your motorcycle rental, hotel package, corresponding Road Book, and a host of other services are all included as shown below, and one of our Bi-Lingual Guides will be carrying your luggage, tools, spare parts, etc. in one of Support Truck that follows according to the itinerary below. 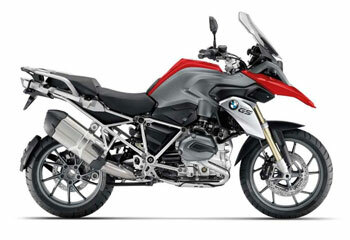 So you'll be "out there," but not entirely alone, and simple things like having your 50+ lbs of luggage in the Support Truck instead of on your bike makes for safer, and more fun riding. The Full Patagonia Adventure itinerary mirrors our Guided Group Tour Package called "Patagonia, Tierra del Fuego & Ushuaia!," which has been our most popular route to date. 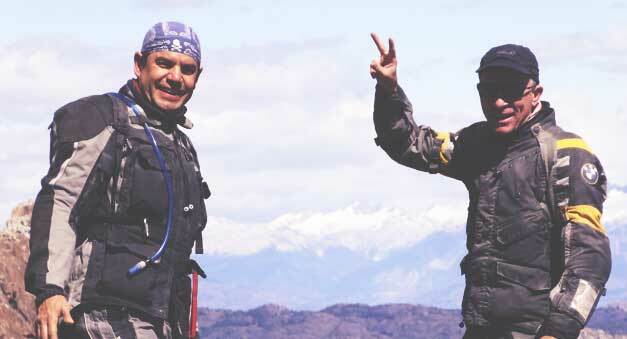 The main difference between these 2 packages is that, on the Full Patagonia Adventure, you are your own Guide. You'll start riding each morning when you want to, move along at your own pace either with another rider or by yourself and enjoy the bounty that Patagonia has to offer. By following a simple Road Book with maps that we provide and having our Support Truck & Guide out there with you, this combines the pure feeling of adventure with some sensibility and convenience in the form of "backup." 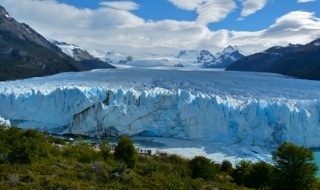 In saying that this is our most popular route, rest assured that you'll be experiencing the absolute greatest highlights in Patagonia, from Pucón in the Lakes District up north all the way down the Ruta 40 and Carretera Austral, crossing the Strait of Magellan and charging across Tierra del Fuego to Ushuaia at "The End of the World!" A Full Patagonia Adventure rider will experience as many major riding and scenic highlights as is possible in this trip duration, while Rest Days allow for activities like whitewater rafting, fly fishing, glacier hikes, etc. As you'll be twisting throughout the Andes Mountains of Chile & Argentina along the way, riders who prefer dirt vs. pavement should register soon, as more and more pavement is being installed througout the region each year. 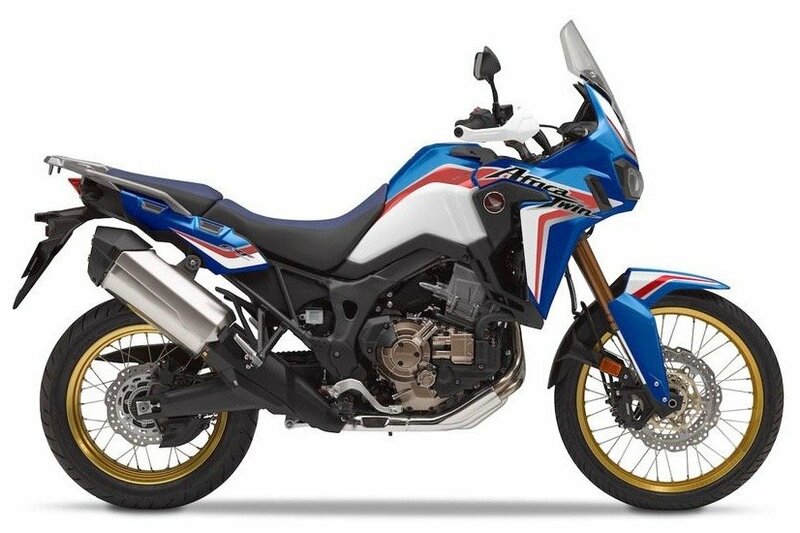 Also, we only have a limited number of each motorcycle model available, so be sure to reserve your spot and motorcycle of choice as far in advance as possible! Trips can be sold out 6-8+ months in advance. Welcome to Chile! Whether you’re taking extra time to explore the capital city of Santiago first or just flying through, riders need to arrive in Pucón, Chile on or before this date, as the riding begins the next morning. Your intra-Chile flights can be booked through www.lan.com or www.skyairline.cl From your home, plan on flying to Santiago, Chile (SCL) and then to Temuco, Chile (ZCO) where we will pick you up at the airport. At the end of the trip, you'll fly from Puerto Natales, Chile (PNT) back up to Santiago (SCL) before heading home. Although this "Self-Guided, Truck Supported" trip format allows for "solo travel," you're welcome to join the group for a Welcome Dinner tonight, and meet some of the riders that will be on the same itinerary as you. One of the things we at RIDE Adventures are most proud of is our ability to bring riders from around the world to enjoy these incredible experiences together. The friendships spawning from adventures and riding challenges like this are often those that last a lifetime. 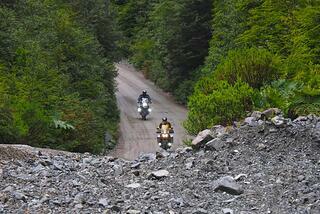 As your riding in Patagonia begins, don't be embarrassed if emotions overwhelm you a bit. Many of us first-timers have been known to yell into our helmets with feelings of disbelief that "I'm riding in Chile!" given the excitement of this momentous occasion. With a fully-paved first day of riding planned, you'll begin by climbing into the Andes Mountains shortly after departure. Crossing the international border for the first time, don't be surprised if emotions are stirred up to even higher levels now. 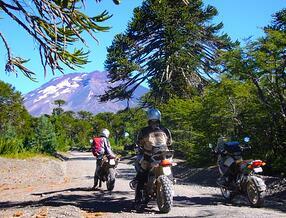 Go ahead ... it's also okay to yell "I'm riding in Argentina!" in these surreal moments, celebrating your decision to make this trip happen. Onward to the charming mountain town of San Martin de Los Andes, be sure to choose take the famous "Ruta de 7 Lagos" (7 Lakes Route) instead of the Ruta 40 for this section. Eventually gliding along the shores of Lago Nahuel Huapi, and on to Bariloche, get settled into the hotel and relax with a nice Argentine wine or local beer with your "asado" (Argentine barbecue) dinner, as there's a long road ahead. Also a great town for shopping, don't forget those riders who couldn't join you from back home! Riders can start their day with an optional ride through the stunning "Circuito Chico," a one-hour loop through Llao Llao to the west of Bariloche with scenery never to be forgotten. Once south of Bariloche, most of the trucks and traffic will take the obvious Route 40 south, but we encourage riders to take a detour through Parque Nacional Los Alerces just to the west. Just before entering the park, you'll ride right past a couple of small cabins noted as the former residence of Butch Cassidy, who along with the "Sundance Kid" once lived and worked as sheep farmers in Cholila. Continuing into the National Park, sweeping sandy turns through the “Fitzroya” trees (cousin to the Redwoods found in California and the tallest trees in all of South America,) beautiful lakes, and mountains will guide you in to the Welsh-settled town of Trevelin. Positioned to cross back into Chile the next day, how did you do on the gravel or "ripio" as it's called in this section? Today marks the start of your ride down the "Carretera Austral" (Highway to the South) and what many folks agree is some of the best riding anywhere in the world. First crossing the Futaleufú River, the route passes near Parque Nacional Corcovado, one of very few privately owned land preserves in the world, arranged as such by the late Doug Tompkins, founder of The North Face and Esprit clothing brands. Heading further south on the Carretera (formerly called the "Ruta Agosto Pinochet,") rain is likely before arriving in the town of Puyuhaupi, but such conditions only add to the atmosphere and adventurous feeling of Patagonia. 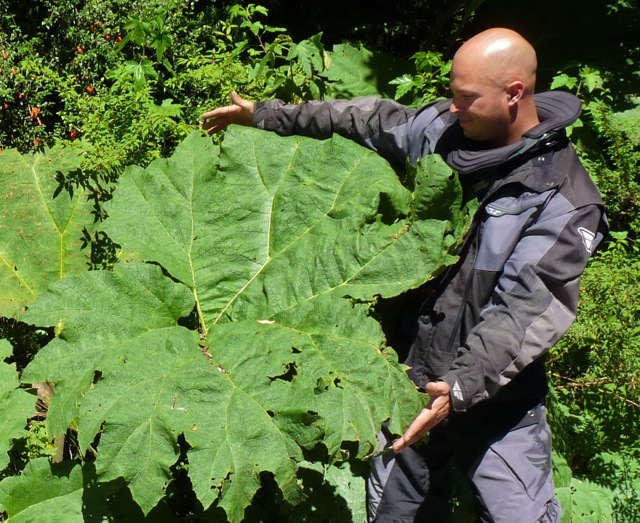 With the gigantic Nalca Plants lining the road, glaciers to the left, waterfalls all around, and the rainforest to be enjoyed, this is unforgettable riding, in one of the most stunning regions of the adventure riding world. If you're going to get rain on this trip, it'll likely be here in the Queulat Rainforest in this valley full of switchbacks and never-ending scenery. Even the most "reserved" personalities tend to burst a bit in this section, as every turn reveals a new view of the precious Patagonia we've grown to love. Waterfalls that cascade down from a few hundred meters high and all the bright green forestry full of the gigantic Nalca plants of Patagonia take everyone into a fun mountain setting of Coihaique, with plenty of local arts, crafts, and dining options to choose from. After Reserva Nacional Cerro Castillo and its sharp mountain peaks, you’ll get your first glimpses of Lago General Carrera, and with any flickers of sunlight, another site never to be forgotten. 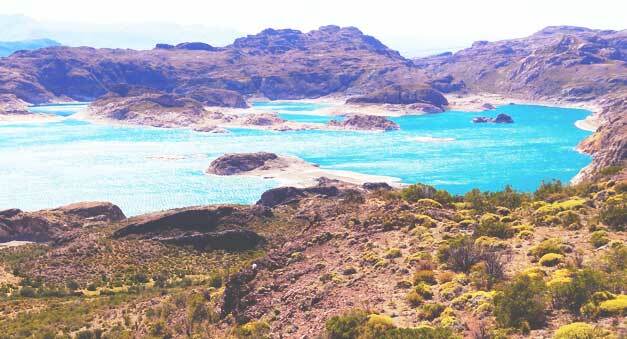 Glacially-fed waters reflect blue light which makes the water bright blue, and combined with more snow-capped mountains in the background, riders might find it challenging to focus on the road to Puerto Tranquilo. If you arrived early enough, opportunities for fishing, boat tours of the nearby Marble Caves, and canopy tours are possible. The rest day in Puerto Tranquilo is chosen for a couple of reasons. First, Patagonia makes for some rigorous riding, so riders need to rest up, and second, because you probably won’t want to leave the Puerto Tranquilo area! You'll be far "off the beaten path” at this point and varying emotions about seclusion and normal life back home are bound to set in. With activities like boat tours, fly-fishing, horseback riding, canopy tours, and river rafting on the Rio Baker, be as active as you like on this rest day. On the other hand, if you really feel you want to ride a little, the fabulous "Patagonia Park," one of the late Doug Tompkin's conservation efforts, is right near by with plenty of guanacos bouncing around the lodge Valle Chacabuco. Leaving this spot about only about 80km from the Pacific Ocean, the route goes along the shores of Lago General Carrera with its blue beauty guiding along rock walls and fantastic scenery on the way back into Argentina. Now get ready for the wind! As Pacific air rolls across the Andes, it typically rushes down the eastern side of the mountains in quite a hurry, so this can be a challenging day of riding later in the day. Just across the border back into Argentina, the quaint town of Los Antiguos gives another look at small town life in remote Patagonia. Just grip down and get through what could definitely be more pounding winds today, as this is part of why Ruta 40 is so famous! Extremely remote territories, very few fueling points, and the wide-open “pampas” region of Argentina again add to the variety in this adventure. Guanacos (like a small llama, indigenous to South America and this region in particular) will be dancing around the road before you, so take extra caution on rides like this. Watching the rickety and sporadic fencelines along the way, you'll occasionally see the carcass of a guanaco who "jumped, but not high enough." The overnight spot of Gobernador Gregores offers another look at small town life in rural Patagonia, and sets riders up for a charge back into the mountains the next day. 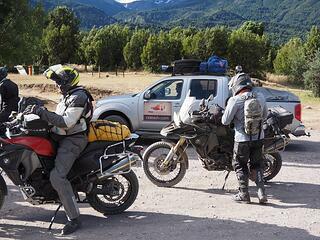 Still out in the Argentine wild, the route heads back west with the Andes in site today. Passing Lago Cardiel and Lago Viedma, the piercing peaks of Mount Fitz Roy and the town of El Chaltén and Cerro Torre will be seen in the distance. 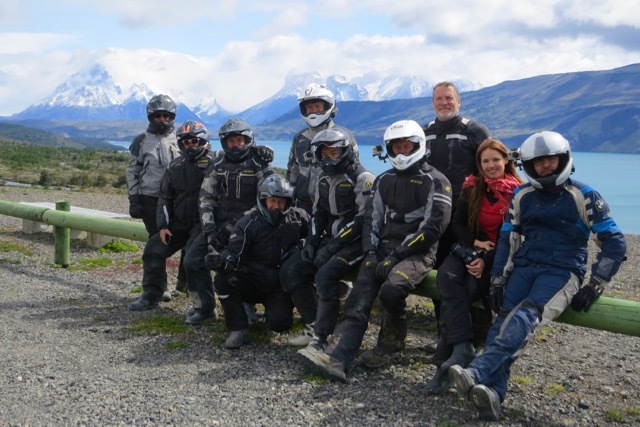 Then passing along Lago Argentino to arrive in El Calafate, this fun town with great shopping and dining options sets riders up to witness one of the greatest highlights in all of Patagonia the next day. It's important to rest once again, and there might be no better town to do so in. But just a short twisting ride in the morning leads riders to yet another incredible site in Patagonia: The Perito Moreno Glacier! One of only 3 known glaciers in the world that is still actually growing, huge chunks of ice will fall off before your eyes, crashing into the bay below. As if this awesome sight isn’t enough, the rumbling sounds of ice cracking throughout the ice field on a sunny day will remain a definite part of Patagonia memories. 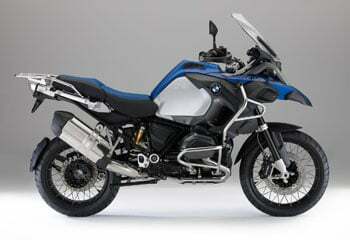 Riders can even opt for a glacier hike, using crampons to scale the jagged surface of this gigantic ice field. 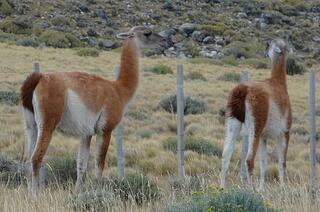 Later, enjoy the town of El Calafate where shopping, crafts, culture and restaurants all await you. Out across the open "pampas" of Argentina and with the Atlantic Ocean in your sites, riders will still want to be careful for the bounty of guanacos bouncing around in this typically windy section. 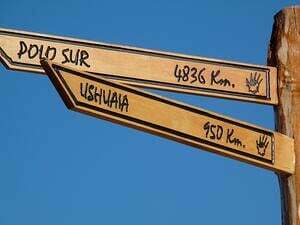 Swinging through Rio Gallegos, the goal is to catch one of the ferries to cross the Strait of Magellan, which means...you've just completed a RIDE to Tierra del Fuego! Such remote territories will again make everyone glad that they have the safety and reassurance of our Support Truck and Guide following behind. 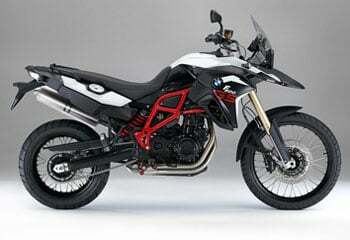 Adventure riders from around the world have dreamt about this moment, and here it finally waits before you. Thoughts about the amazing journey that it took to get this far might sneak into the amazing anticipation that comes with riding to this point, only 1000km from Antarctica. Wide open wind blasts are likely throughout the day until about 100km before arriving in Ushuaia, at which point the scenery drastically improves while you ride through Parque Nacional Tierra del Fuego. Enjoy a nice evening there in town probably focused on a seafood dinner, and buy the very popular post cards to send to people from "The End of the World." A group dinner is certainly appropriate to celebrate the occasion. 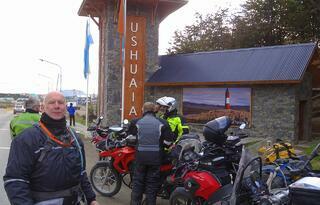 As we'll be explaining upon your booking, riders have a few options to enjoy on this half-day in Ushuaia. Some will choose to visit the Harberton Island Penguins on a 5-hour morning tour involving a boat/bus ride, while others might choose to ride a little further to Bahia Lapataia in the National Park Tierra del Fuego. 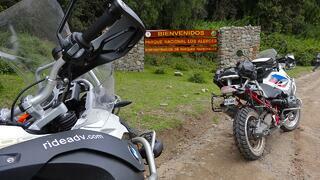 Here awaits a photo opportunity at the end of Ruta 3, which is just 17,848 kilometers from Alaska! You can also send a postcard from Southernmost Post Office at the End of the World, or of course just relax around Ushuaia the entire morning. 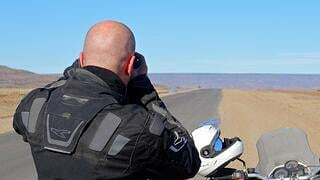 - The afternoon will be spent making a short ride back to the Atlantic Coast and the town of Rio Grande, positioning riders to cross back into Chile the next day. Back to Chile the RIDE goes, and with perhaps one of the greatest finishes to a motorcycle trip ever. First, make your way across the border, across Tierra del Fuego, and to the ferry at Porvenir. Boarding the enormous vehicle & passenger vessel, a few hours will be spent crossing the Strait of Magellan one more time, just like the Explorer that you are. 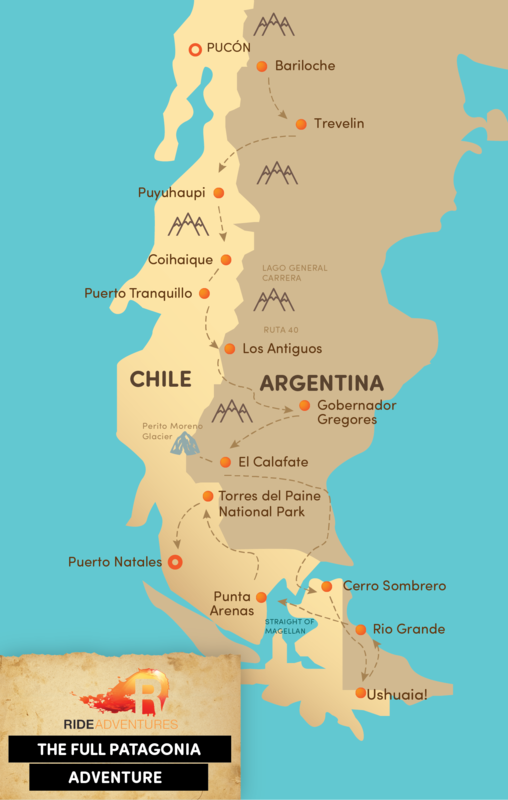 Punta Arenas marks Chile's southernmost (non-military) city, so you'll be able to say you've been "as far south as possible" in both Chile and Argentina on this trip. This fun town on the shores of the Strait is loaded with shopping and dining options, and positions everyone for the ultimate finish ahead. With the Straight of Magellan to your right, and the southern tip of the Andes Mountains dead ahead, riders should make it to the touristy town of Puerto Natales for refueling and lunch by mid-day. Puerto Natales is a booming small town, largely because it's on the edge of perhaps the greatest highlight in all of Patagonia: Torres del Paine National Park. We've specifically allowed for at least 2 possible days for everyone to enjoy the sites within the park, as sometimes cloudy weather obscures famous sites like "Los Cuernos" (The Horns) that will never find justice in any photos herein. Spend the afternoon this day riding to Glacier Grey, and around Lago Pehoe before settling down for an evening in the Park. If cloudy weather the day before obscured your views within this stunning National Park, that's okay because clouds one day often means clear skies the next. Riders have the entire last day to enjoy exploring every lake view, waterfall, mountain peak, and guanaco within this truly special preservation of our planet before heading back to Puerto Natales for the finish. 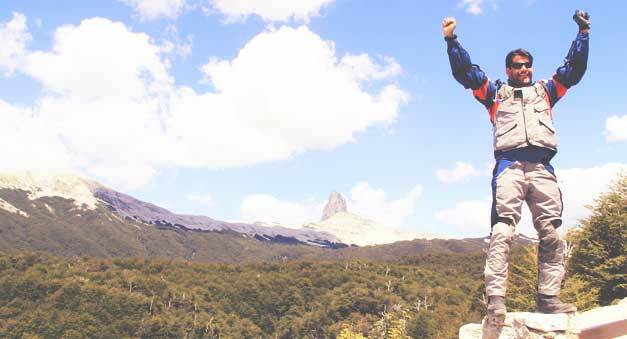 Please note, this itinerary is designed to accommodate those with the extra time to spend hiking famous routes like the "W Trek" within Torres del Paine. Also, it allows us some extra time if needed for the skies to clear in the park, and of course let's everyone finish the trip with one of the greatest highlights in all of Patagonia! Enjoy one final night with the great group of fellow riders you've probably made long this journey. Puerto Natales airport will serve as an excellent starting point for your journey home, so start organizing all those photos, and preparing to show those whom you left behind. 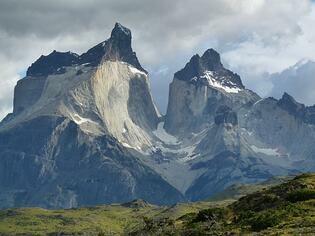 Or are you returning to Torres del Paine for some trekking, and more exploration? You're not alone if you're not feeling ready to leave Patagonia. Congrats to you all, on an incredible adventure ride successfully accomplished. 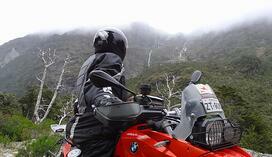 Thank you for trusting in RIDE Adventures to support you on this adventure ride of a lifetime.